K’firim Stars in the Play! These past few days were all about showing our Yavneh talent and ruach (spirit)! On Tuesday, we had machaze hamachaneh (camp play)! Our K’firim took a big part in this year’s “You’re a Good Man, Charlie Brown.” Our banim (boys) and banot (girls) rocked it and truly made us proud! On Wednesday, we spent a lot of the day preparing for our peulat erev (evening activity): Rikudiya-an all-camp dance festival! Each aydah, the madrichim, and almost every staff member in camp prepares a group dance to show in front of everyone at Yavneh! The evening ended with a surprising Maccabiah break out. Maccabiah is an all-camp week-long competition which is run by Kerem. Breakout is the event that starts it all, run by the roshei aydah (unit heads). It was a fun and exciting night! Thursday was our last, but not least, achla yom (trip day). K’firim tzeirim (younger K’firim) went on the Lonesome Lake hike, a nice hike which ends at a beautiful lake. When we got to the top, we had lunch, swam in the water, and went back down to return to camp. K’firim bogrim (older K’firim) went on the Mount Pemigewasset hike, a challenging hike with at the top made it all worthwhile! 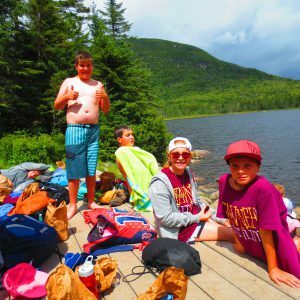 Afterwards, they hopped into Echo Lake to freshen up. 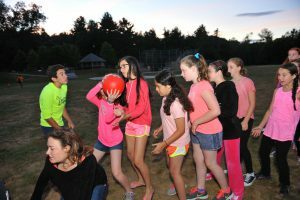 On Thursday night, we finally started the long-awaited Maccabiah! We had some competitions between the 2 plugot (teams), אחוה (brotherhood/sisterhood) and רעות (friendship), and finished off with a fun dance party! We went to sleep feeling happy about our late wake up today: 8:30!! We are so looking forward to our last week of the קיץ (summer), but honestly, we can’t believe the end of camp is upon us. We can’t wait to make the most of it and tell you more about our K’firim endeavors!